At last, the road left the great grey river behind and turned north into the Tolleshunts, the first of which was Tolleshunt Major. Despite the name, this is the smallest of the Tolleshunts, and the church sits away from the village on a lonely bluff overlooking the Hall. Locked, no keyholder. This didn't quite ring true, because this was the opposite of Heybridge, this was a church you'd simply expect to be open. In visits to more than 120 Essex churches, this was only the fourth one I'd come across which was locked without a keyholder notice. 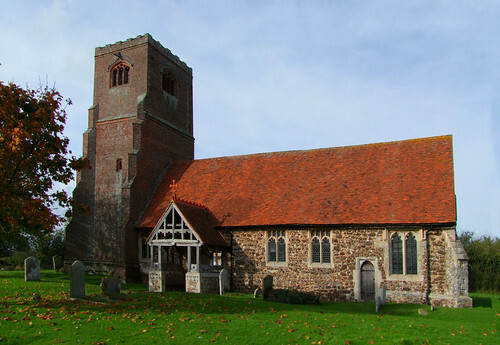 The church is tiny, but with a whacking great red brick tower added on at the end of the 16th century, with none of the style and finesse of typical beautiful Essex brick towers of earlier in the century. Som ewhat surreally, there was a caravan parked hard against the north side of the chancel. The revised BoE has little to say about the interior, and without a keyholder notice it didn't seem worth pursuing the key on what would be a short late autumn day, although I did note that the Rector was that of the next church we planned to visit, Tolleshunt D'Arcy.